I’m someone who likes planning and organisation. I’ve mentioned it a lot recently but planning and pre-writing all these blog posts for while I’m away in Ecuador has been really fun because I like having control and writing. So it also stands to reason that I like planning what I’m going to do next with my hair – in January I was asked by my school to stop dying my hair and after being angry and upset I just went with it and got my hair highlighted to compensate and get rid of the last of the red that I had. I got my hair re-highlighted a couple of weeks ago to brighten the blonde for summer and mostly because I got bored and I like changing my hair pretty regularly. But I’ve been dying to dye my hair more colourfully again ever since I was asked not to – I was originally planning to dye the ends blue for my 5SOS concert back in the beginning of June and I resisted because I was still taking exams and my school might refuse to let me take them. I then said that I wanted to dye it after my exams finished but my mum didn’t really want me to go to prom with coloured hair because ‘these are photos that will crop up forever and you want to look normal’ or words to that effect, less harsh than that actually. As compensation she paid for getting my hair highlighted again. So then I thought I might dye it before I went to Ecuador but then I thought that’s kind of probably disrespectful to the local people who are living in poverty that I can afford to colour my hair and I would have felt weird about it and maintaining it while I was away would have been really tricky so, I’m putting it off again. I get back from Ecuador really, really early on a Wednesday in August and whilst now I’m saying I’m going to try and stay up and keep myself awake until that night, the likelihood is that I’m going to sleep until the next morning. Then on the Thursday it’s results day, so there’s going to be a lot of drama in going to see how I did in my exams and finding out whether I got into uni and what accommodation I got if I do get in and finding out where my life is going to be going in September. After that, I might go back to sleep again or I might try to catch up on the YouTube videos I’d have missed in the month while I was gone, ready to go to a YouTube convention the next day. Yes, I’m going to Summer in the City having been without internet and external communication for a month. It’s going to be interesting. In summary, I’m going to be too tired and too busy in the end of that week to dye my hair then. I get back from SITC on August 16th, I’m home properly on August 17th and I think I go on a family holiday on August 21st. 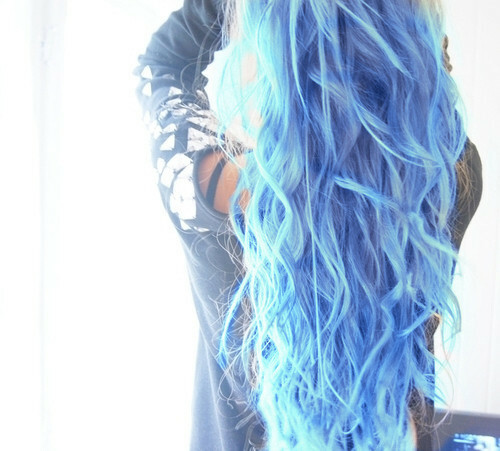 Sometime between August 17th and August 21st, I’m going to dye my hair blue. All of it, my whole head will be blue. I think I’m going to have to bleach it first but I’m doing it, for definite. I’m going to ask my sister to help because she’s really good at dying hair and she’s always done my hair really well so she’s going to do it for me, basically. Depending on how brave I feel regarding uni (if I get in), I’ll either leave it blue or I do have a box of brown dye that I could put on top. I always take good care of my hair (lol). I’m really excited to have blue hair, I’ve missed having coloured hair a lot and blue was my favourite.